At FlowMotion, we're on a mission to help people tell better stories by providing them with easy-to-use tools. Our first product - a smartphone stabilizer - was recently launched on Kickstarter pre-selling 5500 units for $1.3M. Megacool offers a unique sharing technology for mobile games that captures short and sharable videos of the screen. This enables players to easily invite their friends with rich and engaging previews. SYNQ video API gives developers the opportunity to quickly deploy and maintain video functionality to new or existing services without having to reinvent the wheel. Our API takes care of file upload and storage, live video streaming, transcoding and content delivery with multi-CDN. QRRNT AS (pronounced 'current') are introducing an innovative technology to increase the energy recovery capabilities within the shipping industry. Nofence have developed the world's first virtual fencing solution for grazing animals - A gamechanger in agriculture that make it possible utilize uncultivated land for pasture. Sensonomic collects vast amounts of data on natural resources, and provides advanced computational modelling, scenario simulations, and monitoring solutions to improve our clients' adaptation to a changing world. Staaker makes aerial filmmaking easy. It flies itself and uses a tracker to follow and film you automatically. You wear a tracker, which automatically tells the Staaker where you are, and what you are doing. Using artificial intelligence Staaker also knows what you are going to do next. The AI will then decide the best angles to film you from, to give you the high quality cinematic footage you deserve. QiCode connects commercial equipment manufacturers with this that sell, buy, operate and service that equipment. Uninite is a digital platform for matching in the rental market. We facilitate one-on-one finding roommates, tenants finding housing and landlords renting out. It's a global platform for local rental. VIO is a digital platform giving you access to articles from over 60 magazines and newspapers. Through one simple subscription, available on all you devices and customized to to you interests. More meaning, less noise. Smartster is the international marketplace for retail offers. Smart Plants gives you complete monitorial power of your machines, processes, buildings and everything connectable. It is all about how smartly you want to work and that's where we come in. DiggEcard - the worlds first gift card solution that allows you to buy, send and use gift cards straight from your mobile phone. Every day, millions of skilled workers spend hours doing menial, boring finance and accounting tasks. Luca Labs AI software enables employees to work on meaningful and challenging issues, instead of registering invoices, reporting travel expenses and other menial tasks. JodaCare is a digital communication solution that connects family caregivers and health personnel taking care of the same patient. We want to empower human diginity for people with dementia disorders or other disabilities, and strengthen their relationship with with health personnel and family members. By providing this vulnerable group of people with consistency in their everyday lives through photos and dialogue they will experience a new sense of ease for both themselves and their families. Music streamers + social features = a new exciting platform which is designed to connect people through music. Request, share & experience music together! We are creating a paperless shareholding tool for investors and startups. vibble is a Norwegian music app that helps people stop listening to music and start playing with it. If Spotify and Instagram had a baby, it would be vibble. With vibble you can turn your favorite music into creative mixes, just by swiping a finger. We are developing a platform for instant collaboration and prototyping in Virtual Reality. We allow you to drag and drop 3D-files into VR and interact with them together with colleagues, independent of location. VILLOID has built the easiest way for consumers to shop the style of their favourite influencers. In only 5 minutes, influencers use the VILLOID e-commerce platform to set up their very own shop, and sell directly to their followers. VILLOID handles everything from customer service, payments, inventory and fulfilment. The influencer is left only doing what they are great at: Curating quality content to their followers. DeskVibe is a digital platform that optimizes workspace capacity and flexibility while connecting users with relevant networks to strengthen their businesses. A web based collective with freelance-designers that creates solutions for web, presentations, logos, illustrations and animation. No Isolation is a Norwegian startup, founded in October 2015 by Karen Dolva, Marius Aabel and Matias Doyle. The company tackles loneliness and involuntary social isolation, by being a thought leader on issues related to the topic as well as building tools for people living in vulnerable situations. The first tool made is AV1, a robot created to help children and young adults with long-term illness participate in their everyday life. AV1 was launched in August 2016, and is currently helping over 180 children and young adults in Norway, Sweden, Denmark, United Kingdom and the Netherlands. No Isolation has 40 employees and offices in Oslo and Amsterdam. Boa Tech AS makes solutions that improve everyday work in retail. Currently we are developing a real-time sales reporting system. Salespersons are equipped with a watch that enables them to instantly report sales. This gives real time feedback on sales, which open a broad room of possibilities. Some of them are sales improvement, sales gamification, real time sales monitoring, customer conversion rate and key insight of shops. Bergensia -The Sustainable Gazette pushes and inspires organizations to innovate and realign their strategy and purpose towards the SDGs. ALTINA is a complete digital tool for coaches and their athletes. ALTINA makes digital planning, monitoring, and analysis simple and smooth. Plan and log for a wide variety of sports with as much details as desired. All coaches connected to an athlete can monitor the athlete’s workouts and get the total overview of each athlete’s progression. Ably is revolutionizing the very base of patient recovery. In close cooperation with health professionals, we redefine what a hospital bed can be, from ground up. digipig is reintroducing the traditional piggybank in a modern form as a physical piggybank connected to the childs bankaccount, showing balance, deposits and saving tips - and more. Even in a cashless society the child can easily learn about money and saving - in a fresh and engaging way. Dedicated teams monitor turtle nesting beaches every night to locate and protect the nests until hatching. All data is written on paper and transcribed, but many nests are lost due to poor landmarks. Our digital monitoring and recovery system locates where and when the hatchlings will emerge next, which results in better conservation and more accurate research data. By Nature, is a non-profit company that promotes Norway’s green solutions, technologies and expertise to a global audience. Our profiling of Norwegian innovations on www.bynature.no will be backed by dedicated visitor centres. As sport, car and outdoor enthusiasts, we have all experienced the challenge of loading gear on and off a car roof. Together we wanted to solve this challenge once and for all. It all started with a lowerable roof box. Then we took it a step further. We developed a roof RACK that can be loaded beside the car, and with anything! Countless hours of market research and product- and business development have passed since the very start of the Dropracks adventure. So who are we? The core team behind Dropracks consists of highly dedicated business- and product developers with backgrounds from the Norwegian University of Science and Technology (NTNU) in Trondheim. In addition, Dropracks has a strong Board and a team of mentors and experts with relevant industry experience. bitHammer is the studio behind the retro game "UFO Hunter". We make the world slightly better... and slightly less serious! We are building an organization network in the form of an online collaboration platform. The network will digitalize organizations' value chains and help track people and activities. Zeipt is an open platform for digital receipt distribution. We facilitate the technical- and contractual aspects of distributing digital receipts from retailers to their customers. Småkassen tilbyr et abonnement med forskjellige kasser tilpasset barnets alder, utvikling og behov. Wiralcam is a new lightweight camera accessory to get dynamic videos in places where even drones can’t go. WA is a CV for IT people. Position your company towards highly demanded professionals on wa.works, and instantly know which one of them is best suited for your tasks and challenges. Helping people make more informed decisions by building the "Google Analytics" for society. We make video software for professional-client meetings. We connect consumers with local, organic (small scale) producers, and deliver at home on demand. PREP is the brand, currently being developed by Pelago FinTech Innovation Group AS (who also will own and control the IP). Will go operational with South African company PREP Community (Pty) Ltd (under establishment). PREP is a seamless, fully integrated Experience Management Platform for high-touch service providers and their customers, especially effective handling groups. Early development stage, cooperating with tech and market collaborators in Cape Town, South Africa, where we also will do our A- and B tests, plus do initial rollout. Then we take the rest of the world from there. At Fintech Innovation we are building revolutionary systems for the global financial and bank sector. We are a FinTech company launching a global bank – Soci80™ and BankBridge™ with a vision to be the leading interbank communication platform in the world. time to riot is a smart hiring platform, using data driven machine learning to solve the frequent hiring needs for the project driven entertainment industry. AppsCo helps you manage access to your company applications and gives you meaningful insights over your sensitive data flow. In today's Subsea industry, numerous of pad-eyes and a large number of different shackles have been used to put in place and remove expensive Subsea installations. Often the lift is specially designed, which in turn requires special equipment to reverse operations previously done. With our innovative INOshackle, developed with this in mind, we want to Standardize shackles all over the World. This will ensure the Operator Companies a predictable operation and cost. In addition to this, the INOshackle cost, less weight, safety is ensured, and not least: Water hydraulic and does not pollute the Environment with any oil spills. Vision: We will have the major marked share in a few years from now. MyMuse is an online store that sells exclusive women’s lingerie and intimate wear in the European market. We offer high-quality products, with unique designs, that are available in a wide range of cup sizes. Time2Staff, work today, get paid tomorrow! VIBBIO is a videotech company, specializing in smart video. We are building technology to remove the barriers of time and cost from the video process, enabling video-first toolsets for businesses. Inzpire.me is a data driven, global platform connecting brands with influencers who can market their product. EyePickIt measures the variance between conscious and subconscious selection using eye tracking technology. Our system has both commercial and consumer applications, helping them both determine what exactly is it about an image elicits an emotion. Tibber is the service where you buy, save and share energy in a new way. It is basically an app which replaces your energy company. Cloud Insurance was founded in 2012. They are on a mission to facilitate the insurance industry’s transition into a more lean, customer-focused and fast-moving way of doing business. They have a global approach and frequently deliver to the UK and US market. Lifekeys provides online mental health services through online consultations with qualified psychologist and an evidence-based program. Tekslo Seafood is harvesting seaweed sustainably and ecologically from the outermost “skjaergaard” outside Bergen , Norway. Just as our ancestor did. We have launched a product series named Sjøsaker™ which consist of high-quality seaweed products which will be sold globally. Convasti is the smart and easy way to get rid of your waste, using only your phone. All you need to do is take pictures of what you want to get rid of and independent drivers will give you offers to do the whole job for you. Manual sorting and reuse give us a better environment for the future. From standalone simulation tools to consulting services, Shoreline can provide you with what you need to assess, develop, construct and operate wind farms profitably. Born and developed in Norway, famous for its rough coastline, and world-leading subsea expertise, Blueye will provide the world’s finest underwater drone for ocean exploration. It provides you with unprecedented access to the hidden world below the surface. XXLtable is a web-based tool for smarter and better operation of dining places and bars. Payr makes it easy and fast to pay invoices, with flexible payment sources like cards, e-money or any bank account. Based on data from paid invoices, we make it very easy to compare and switch to better or cheaper providers of electricity, mobile subscriptions, loans, insurance and more. We dramatically simplify the cross border shopping experience by providing Norwegian residents with a USA address with unique suite number and a prepaid MasterCard registered to this address. This enables them to shop online from the full spectrum of USA online sellers and with very competitive shipping rates. We've simplified the customs clearing process so shopping online from the USA is as easy as shopping online in Norway. Scandinavian Reach Technologies are developing innovative and game changing ways of handling emergencies on offshore vessels. InRange by Scandinavian Reach Technologies provides instant personnel on board control, allowing immediate and high precision rescue team involvement. Arveng Technologies believe in expanding the limits of what humans are capable of doing. Their first step towards this vision is to make the IRV Smart Glove, which will provide a completely new, fun and revolutionary way to control drones. This highly technological glove fitted with various sensors is intended to replace the traditional RC. OceanHub is the Ocean Space knowledge community. Ejector creates technology that saves lives and property when charging or using devices, wherever you are, whether it`s night or day. We are developing our patent-pendin Ejectorsocket and multiplug, the next generation of electrical sockets, that remove the human factor so overcharging, fires, meltdowns or explosions are removed from the equation. You just live a safer, cooler life with Ejector stuff. Because we`re only human. Developing a strategy-game called Dwarfheim. Scandinavian design furniture system changing the way you interact with furniture. Design and build the solution you need. No tools required. CTRL Events is the only app you need to get control of all the events, clubs and concerts in your town - buy the tickets from your app , go inside and take CTRL. Developing an app that gives you the opportunity to earn money base don your Instagram-profile. 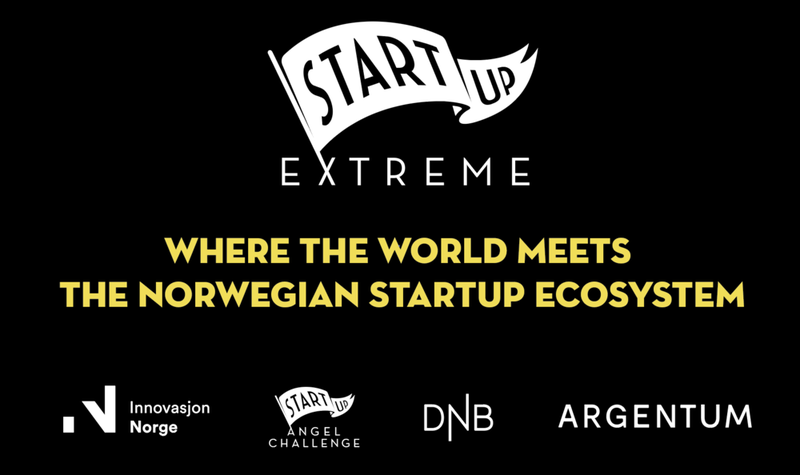 Startup Extreme is supported by startup ecosystem players from all over Norway. Together we aim to create an event that showcases the many hidden startup secrets from the fjords and mountains of Norway, to support the growth of new startups and scaleups, and inspire the next generation of entrepreneurs from our communities. Startup Extreme 2018 is organized by the team at Angel Challenge. "By professionalizing the startup industry together, we support the entrepreneurial superstars of tomorrow!"